Which Irrigation Upgrades & Soil Improvements are eligible and how much money can I get for each? What should my photos include? Why is the RDN offering a rebate program for improving the water efficiency of established landscapes? What are the benefits of improving the efficiency of my irrigation system? What are the benefits of amending my soil with quality compost, soil and mulch? Do I need a Building Permit to perform retrofits to my irrigation system? Why do I need to work with an irrigation professional certified by the Irrigation Industry Association of BC (IIABC)? How do I find an IIABC certified irrigation professional? For the Irrigation Upgrades, what are the required features of upgraded system components? What is the difference between compost, soil and mulch? Where do I purchase quality top soil, compost, and mulch? How do I ensure I'm choosing high quality top soil, compost, and mulch? How do I know if I need to amend my soil? How much topsoil and/or mulch should I be adding to my garden? How do I figure out how much top soil or mulch to buy for my yard/garden area? Can I apply to the rebate to help with the installation of a new landscape (i.e. as part of a new build)? Am I eligible for a rebate if I add a rain, weather, or moisture sensor to my irrigation system that does not currently have one? Dual-project Rebate - Up to $100: Applicants who are pre-approved for both Irrigation Upgrades AND Soil Amendments under the rebate program may be eligible for an efficiency bonus of up to $100 upon completion of their project. To be pre-approved, photos showing existing areas that require upgrades described on the Pre-approval Application Plan Description(s) must be submitted. To receive your rebate for works completed, photos showing the eligible upgrades must be submitted with your Claim Form. Photo(s) of all completed irrigation upgrades, such as new components installed to replace conventional components (i.e. smart controller, rain/weather/soil sensor, drip irrigation, MP rotator emitters). Photo(s) of lawn/garden areas that received soil amendments. Please see the questions "How do I know if I need to amend my soil? How much topsoil and/or mulch should I be adding to my garden?" below for more information about required amendment depths. "Before" and "after" photos of the site can be sent digitally through email to watersmart@rdn.bc.ca. Photos can also be mailed or dropped off to the RDN Administration office at 6300 Hammond Bay Road, Nanaimo, B.C. V9T 6N2. During the summer months, water use in the RDN doubles and sometimes triples! Most of this increase in use is due to our outdoor water demand, primarily to keep landscapes green and fragrant during the dry season. Meanwhile, longer, drier summers and lighter snow packs mean longer watering seasons and less precipitation and snow melt to recharge aquifers and reservoirs during the summer months. In addition to outreach through the RDN's Team WaterSmart and watering restrictions, the RDN's 2013 Water Conservation Plan identifies the development of "a rebate program aimed at improving household water efficiency related to outdoor water use" as a priority measure for 2014 - 2016 (2013 Water Conservation Plan, p. 26). Adding organic mulch to the top of garden beds to regulate temperature and reduce evaporation. See Team WaterSmart's "Top 10 Irrigation Tips" brochure for more information. Improving the efficiency of your irrigation system will help you to reduce your landscape's water consumption, while allowing you to deliver water only where you want it to go. This results in water savings and a healthier landscape. Not only will you save on your water bill, but you are working to conserve and protect our community's water resources to ensure a sustainable future in our region. What are the benefits of amending my soil with quality compost, soil and organic mulch? It starts with the soil; there is nothing more important to the success of a garden than healthy soil. The combination of minerals, soil organisms, and organic matter (compost) - or 'growing medium', as the combination is called in the landscape trade - will determine almost entirely the performance of plants in terms of survival, health, growth rate, and water needs. Nurturing healthy soil can double the rate of plant survival and growth, and cut landscape water needs by 50%. In part, this is because healthy soil acts like a sponge, holding water and nutrients in the root zone of plants. Furthermore, healthy, absorbent soil is a key part of property storm water management, as it increases your landscape's ability to retain water from large rainfall events. And yet, good quality soil is often one of the first things to be sacrificed to save money in landscape design and maintenance - that's NOT WaterSmart! The addition of mulch can reduce water lost from soil through evaporation. It protects your investment in cultivating quality soil, by reducing evaporation, leeching, and erosion. Mulch also reduces weed growth and adds a finished look to a garden while providing nutrients to plants. Together, healthy soil and organic mulch maximize the water-retaining potential of our landscapes, allowing us to maintain a healthy garden with less water. No, a building permit is not required for the Irrigation Upgrades eligible under this program. However, if you are conducting the irrigation retrofits as part of a larger home improvement project and are unsure whether you will require a permit, please contact your local building department. If you are in the RDN, contact RDN Building & Bylaw Department at 250-390-6530. Why do I need to work with an irrigation professional certified by the Irrigation Industry Association of BC? To qualify for the Irrigation Upgrades & Soil Amendments Rebate, irrigation system upgrades must be completed by an irrigation professional certified by the Irrigation Industry Association of BC (IIABC). The IIABC's standards and guidelines promote water, soil, and energy conservation practices through efficient irrigation system design, installation, and management. IIABC Certified Irrigation Professionals have taken training courses on these topics and have passed industry-standard certification exams, making them knowledgeable about industry best practices and current efficiency technologies. Certified Irrigation Schedulers and Certified Irrigation Technicians - Level 2 have a higher level of training than Certified Irrigation Technicians - Level 1. There are many IIABC Certified Irrigation Professionals with different levels of training working in our region, please see the list below and/or visit IIABC's Membership Directory; to locate IIABC certified irrigation professionals in the RDN, refer to www.irrigationbc.com - click on "Find a Certified Professional Here" and search by Classification ("Technician") and Area ("Vancouver Island/Coast"). If you know of a business that should be on this list, please email watersmart@rdn.bc.ca. For a checklist of which features your automated irrigation system must contain to be eligible for the Irrigation Upgrades Rebate review page 2 of the Irrigation Upgrades & Soil Amendments Claim Form. What is the difference between compost, soil, and mulch? Compost is decomposed organic matter; it is effective in improving soil quality by providing nutrients, reducing erosion, and retaining moisture. Topsoil is the upper layer of soil, usually the top couple of inches, where there is a high concentration of organic matter. Topsoil is often where we see earthworms living, and there is high biological activity in healthy topsoil. Mulch is a layer of material that is applied to soil surface to reduce weed growth, regulate soil temperature and conserve soil moisture. Examples include woody mulches like bark mulch, and organic mulched like grass clippings, leaves, or straw. Peat Moss is a partially decayed form of sphagnum moss from bogs; it is excellent for aerating and creating pore space but lacks nutrients and biological diversity that compost provides. Sand is an inorganic granular material, made of fine particles of rock and minerals. Sand provides no nutrients and has no ability to hold moisture; rather it is very fast draining. Soil marts, nurseries, garden centers, and home improvement stores offer a wide selection of topsoil, compost, and mulch products by the bag or in bulk. Many companies also offer delivery options. Sustainably harvested amendments that are free of weed seeds and do not leach toxins are good for your landscape and the environment. Ensure that all products you use on your landscape are watershed friendly! How do I ensure I'm choosing quality top soil, compost, and mulch? It's important to be a savvy consumer when purchasing soil, compost, and mulch. The following tips will help you to choose a quality topsoil, compost, or mulch product. Growing medium is often a mix of topsoil and organic matter (compost), and sometimes sand. Topsoil that is too coarse (no silt or clay) or too dense (no sand). A sandy loam is the optimum texture - this is a combination of about 40% inorganics (sand, silt, clay) and about 60% organics (nutrient-rich compost, soil, peat). Topsoil that is weed infested. Seeds can lay dormant in topsoil for years. Look for a topsoil source that is weed free. Compost that is not yet decomposed - livestock manure often has both of these problems. This robs the soil of nitrogen. Decomposition (and weed) problems can be avoided with a proper composting process. Purchase growing medium from reliable suppliers and contractors who can certify that the products meet the specifications of the BC Landscape Standard and local bylaws. Quality soil and compost purchasing tips are taken from Team WaterSmart's Landscape Guide to Water Efficiency. Look for mulch made up of a mix of fine particles as well as larger, more obvious pieces. Medium coarse mulches are a good option as they allow water through from the surface more readily and prevent soil crusting. In addition, the larger pieces break down more slowly, meaning you need to re-mulch less often (every 3-5 years, instead of every 2 years with fine mulches). Bark mulch ranges in texture from fine to medium coarseness, and in color from light (wood chips) to dark (composted bark mulch). Keep in mind many mulches change colour with exposure. Wood chips can be a good, inexpensive option, but be sure to inspect the product's quality before purchase. Take a look at the mulch pile, and if the supplier processes it on site, look at the raw product. If you see pieces of metal or nails and screws in and around the pile of mulch, or if there is no bark pieces at all, only a fine brown "mulch", those can be signs that the product is made from a treated waste wood product, rather than leftovers from raw wood processing. Please note, small rocks are not a sign of poor mulch, but commonly found due to the process of loading the material. Water the soil around the shrub's root zone thoroughly. Apply the fine mulch and water it thoroughly. Add the coarse mulch on top and water it thoroughly. Other mulches include leaf litter, grass clippings, or straw. If you are choosing straw mulch for veggie gardens or strawberries, be sure that you are getting straw and not hay. Hay contains a higher concentration of seeds and could cause unwanted weed growth in your garden. Dig a test hole in typical areas of your yard. If the depth of good black crumbly soil is less than 150 mm (6") under lawn and 300 mm to 450 mm (12" to 18") for shrubs, you are likely using more water than you should. Rather than starting over with new plantings, it is possible to gradually add to your soil depth by topdressing with thin layers of growing medium and well-composted organic matter. For grass areas: Topdressing should not exceed 6 mm (1/4") depth at a time. Once grass is established, stop removing the grass clippings from the surface. Mow regularly, and allow the clippings to decay into the soil, where they will recycle the organic matter and nutrients back into the soil organisms and the grass. For shrub and groundcover areas: The minimum recommended depth per top dress application of topsoil or compost is 50 mm (2"). The maximum depth could be as much as 75 mm (3''). For on-going maintenance once adequate soil depth is in place, use organic mulches like bark mulch to protect your recent investment in the soil by reducing soil moisture evaporation, minimizing weed germination, and providing a long-term supply of organic matter. Allow leaf drop to remain - this builds up a 'natural duff' like in the forest, building the soil, soil life, and recycling nutrients. Apply mulches at a minimum thickness of 50 mm to 75 mm (2" to 3"). Inspect depth seasonally and add as required to maintain minimum depth. Approximately 6 mm (1/4") for lawn areas, and 75 mm (3") for garden beds is the required depth of soil amendment to be eligible for the rebate program. 50 mm (2") is the required depth of mulch in garden beds for eligibility to the rebate program. In addition, applicants must be top dressing at least 37 m2 (400 ft2) of landscape area. Search online for a topsoil or mulch calculator like this one to help you calculate the amount of soil or mulch needed to cover your target landscape area to the desired depth. A helpful guide is that one yard of soil will cover approximately 320 ft2 to a depth of one inch. Here is a brief summary table that outlines approximate volumes of soil required for different sized garden areas. *Recommended depth refers to the minimum amount of organic material (soil, compost, mulch) added to qualify for this rebate. No, this program provides support for homeowners to improve the efficiency of existing residential landscapes only. Garden beds and lawns must already be in place to be eligible for the soil rebate. Applicants must be retrofitting or upgrading a pre-existing automated irrigation system that possesses a control timer, irrigation lines, and conventional sprinklers, such as pop-ups and rotors, to be eligible for the irrigation rebate program. However, it is recommended that new landscapes be designed and installed with water efficiency in mind, by utilizing efficient irrigation options, ensuring an adequate base of quality soil and mulch, and choosing low-water use or drought tolerant plant species. 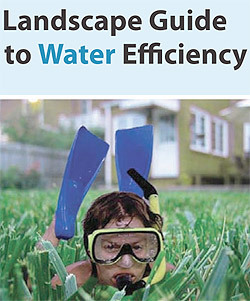 See Team WaterSmart's Landscape Guide to Water Efficiency for more information on water smart landscapes. Yes, if you currently possess or are upgrading to a ‘smart’ irrigation control timer that supports sensor hook-up, you are eligible for a rebate. Rain, weather, or moisture sensors are able to temporarily shut-off irrigation controllers when it is raining or when soil moisture levels are sufficient, resulting in up to 15-20% water savings and perfectly watered vegetation!